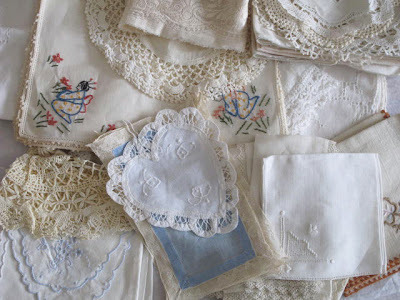 I recently uncovered my rather impressive stash of vintage linen and lace doilies and hankies. It's difficult to walk by these heirlooms when you happen to be at a church bazaar, and they are practically paying you to take them. I, of course am always happy to oblige, and outside of offering some of these goodies to my talented and crafty friend, Colette, I am still stumped as to what might come of them, but for now, they are just for admiring I guess. I hope you are having a wonderful week, Jocelyn!